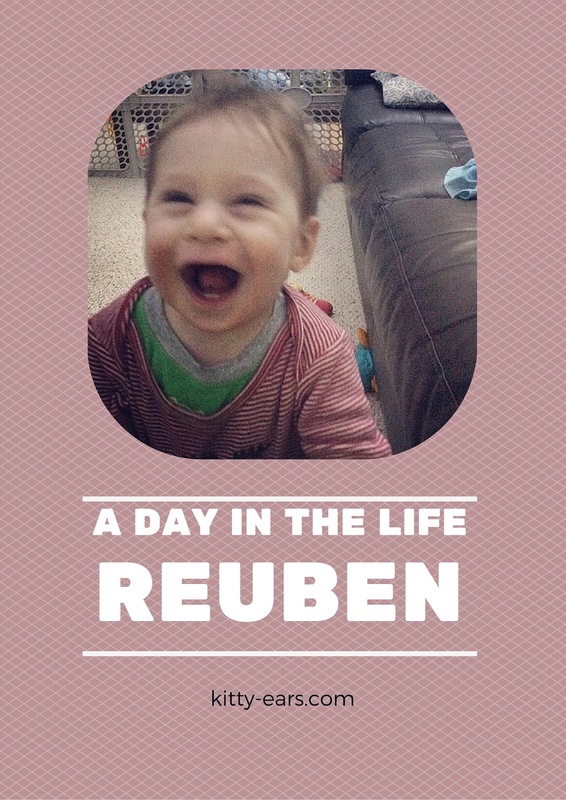 This is what a typical weekday looks like to Reuben when we stay home. Or, what I imagine it looks like to him, since he can't talk much yet! This has been our standard routine from about 4 months until now (7 months). Who knows when it will change? I also didn't have time to take pictures throughout a whole singular day, so these are from various weeks. 7am: I wake up even through Mommy still wants to sleep. 8: Nursing! Then Mommy plays on the floor with me. 9: More nursing, Mommy plays with a white square thing and it distracts me, but eventually I fall asleep. 9:15: Mommy tries to lay me down for some reason. I wake up. Mommy! 9:20: Mommy unsuccessfully tries to nurse me again hoping I will sleep. I'm too interested in crawling on her face. 9:25: What is this? I am put in a cage and mommy stares at a glowing light. She calls this "me time"
9:45: I don't like me time. I will throw a fit. 10:00: Back in the living room, mommy plays music and sits on the floor with me holding a bowl of oddly smelly "toys" she won't let me play with. 10:45: I get to play with mushy stuff while mommy makes clanking noises in the kitchen! 11:10: Mushy stuff no longer amuses me. Whereforartthou mother? 11:20: Bath. Mommy washes me in the warm place. How did so much mushy fun things get all over me? Suddenly I'm cold and mommy wants to put clothes on me. Time to cry! 12:00: More nursing, I fall asleep again. Mommy tries to put me down and I sleep for 15 minutes. I don't know what mommy does when I am asleep. 12:20: Play. Mommy goes in and out of rooms singing to me as I play in my play-place. What fun! I try to eat her knitting she left on the chair. 12:22: Knitting is removed from my paws. Time to play with blocks! I love blocks. They taste WONDERFUL! 12:40: Where is my mommy? I must be attached to her! She puts me on her front and we go for a walk. 12:50: I love to look at all the wonderful neighborhood things and try to jump out of my carrier. But Mommy is warm and she sings to me as I walk, and kisses my face. Kisses are funny. 1:30: Mommy reads me a book! I love books. 2:00: I play in my play pen while mommy lays on the couch. She looks tired. I should go crawl on her face! 2:10: I can't reach Mommy's face from the floor. I will stand next to the couch and look pitifully at Mommy until she picks me up. 2:30: Mommy turns on loud music and jumps around the living room. I watch her and laugh. 3:00: I am back in the cage and mommy is in the shower. 3:10: I loudly let mommy know I am tired of being in my cage. 3:20: mommy tries to sing to me while she puts clothes on herself. I am still in my cage. I am upset. 3:30: Yay mommy is holding me. Post cage nursing. 4:00: If I am good I stay in my play-place while mommy makes clanking noises in the kitchen. If I miss mommy she puts me in my highchair. If I hate my highchair she puts me on her back. Yay mommy! 5:00: Post cooking nursing. I fall asleep nursing, mommy tries to put me down. I wake up. Hi mommy! 5:30: Mommy says she's had enough. She turns the loud box on. I play on the floor while mommy watches the box. 6:30: Mommy calls daddy and asks where he is. She nurses me while playing with fun squishy things that she won't let me touch. Why can't I touch the fun things, mommy? 7:00: Daddy comes home and plays on the floor with me! 8:00: Mommy nurses me! I decided to be wonderful and fall asleep nursing at a reasonable hour. 9:00: Mommy carries me up to bed and snuggles right next to me. I wake up but she nurses me so I fall back asleep because mommy is right next to me. 2:00: Nursing more. Also time for me to randomly wake up and crawl on daddy's face. Whee, hi daddy! ...and repeat from the top... Whats your day look like with your little one?